Journalists in Nepal have been staging protests against the Maoist party after it admitted to killing a reporter, Birendra Sah. He was abducted in southern Nepal last month. The Maoists, who signed a peace accord last year, have suspended three members over the incident. 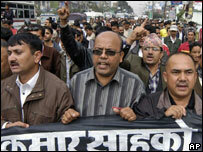 The Federation of Nepalese Journalists said hundreds of their members took part in a rally in Kathmandu. The Maoists have said that the perpetrators will be punished. FM radio stations observed a two-minute silence on Tuesday. Mr Sah worked for Nepal FM radio and Avenues television. "Had the Maoists and the government taken the news of his abduction seriously immediately after we broadcast the news, Sah might not have been killed," managing director of Nepal FM Bishnu Hari Dhakal said, the nepalnews.com website reports. Earlier this week, police said they believed a body found near the abduction site might be that of the missing reporter. After Mr Sah went missing in the southern district of Bara, a series of delegations of journalists and human rights workers went to the area. Each concluded that a group of local Maoist leaders had kidnapped him. The Maoists' national leadership had given conflicting accounts of their party's involvement. But on Monday a committee of their own MPs announced the results of its own inquiry and said it believed Mr Sah was indeed shot dead in the jungle by two Maoist officials on the orders of the district party chief. The committee said the three had all been suspended by the party but were still at large. The BBC's Charles Haviland in Kathmandu says that by Maoist standards, this was an unusually frank account of their party activists' transgressions, nearly a year after their insurgency officially ended. The Maoist leaders have stressed that abductions are not party policy and that those responsible for Mr Sah's death will be punished. But our correspondent says their control over party workers lower down the ranks seems to be limited. This new admission comes after a majority of members of parliament voted to instruct the government to prepare the ground to end Nepal's monarchy and make the country into a republic. The resolution is, however, non-binding, and last year's peace agreement stipulated that the issue be decided by a new assembly which is yet to be elected.